Composed of the Special Representative of the Secretary-General of the United Nations, the Ambassadors of Germany, Brazil, Canada, Spain, the United States of America, France, the European Union and the Special Representative of the United Nations Organization of American States, the Core Group firmly rejects the acts of violence perpetrated during the recent street protests in Haiti. Related: US Embassy in Haiti asks Haitian politicians to clean up their acts! The Core Group welcomes the Executive's commitment to continue the dialogue and calls for an inclusive dialogue between all the actors of the national life to get out of the crisis that the country is going through and to meet the expectations of the population. Related Kenneth Merten tells the Haitian Opposition: You want to rule the country? Win the next elections! 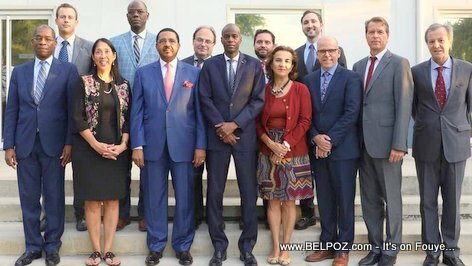 « US Embassy in Haiti asks Haitian politicians to clean up their acts! Ki sa wap pale la a? Si prezidan sa a ale, lot ki monte nan pouvwa a pap vole?